Why are Ready-Made Gluten-Free Products so Expensive? Celiac disease and gluten sensitivities as a whole have been on the rise in North America and in various regions around the world. 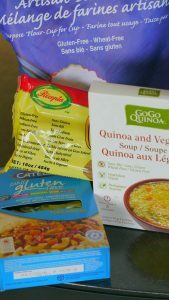 The mainstream marketplace is now stocked with gluten-free foods to substitute pasta, bread, cookies and flour – all items that are usually full of gluten. Gluten can cause serious health complications for those who are intolerant. Aside from short-term reactions (usually indigestion, pain, bloating and rashes), they can develop chronic stomach distress, anemia, osteoporosis, autoimmune diseases and even lymphoma in the long-term. So now that many food manufacturers are making gluten-free products – why are they so expensive? To the consumer, it feels like they are trying to make a quick buck off the trend, but there is more to it. Right now, the cost of gluten-free products is 242% more expensive than standard foods on average. What is the rationale behind these costs? Essentially it comes down to the strict need to avoid cross-contamination. Cross-contamination with gluten is difficult when food manufacturers need to put specific procedures in place to address this risk. Not only do these procedures need to be created, they need to be continually amended and documented in order to keep tight communications with their customers and suppliers. This is to make sure that if an issue were to arise, that they can halt their production and fix the issue immediately. There are additional factors that can increase the costs to manufacture gluten-free foods – connecting to the reason that consumers see a spike in food costs. Factories need to be cleaned more frequently to remove any chance of cross- contamination. There is less competition in the market because it’s hard to meet the production standards. Ingredients that substitute gluten as a binding agent like guar gum and xantham gum are highly expensive (this is what goes into gluten free flour blends!). The supply of gluten-free products is limited in stores and then gets put into larger grocery stores with higher price margins. There doesn’t seem to be a window of opportunity to see the prices going down any sooner for ready-made gluten-free products. However, to counter that, we offer recipes, tips and tricks to make your own gluten-free foods at home to encourage you to cook, bake and explore new options like making your own flour blends. This is a great opportunity to take control of your health and regulate what is being put into your body. It’s well worth it in the long run! Check out some of our healthy gluten-free recipes here.